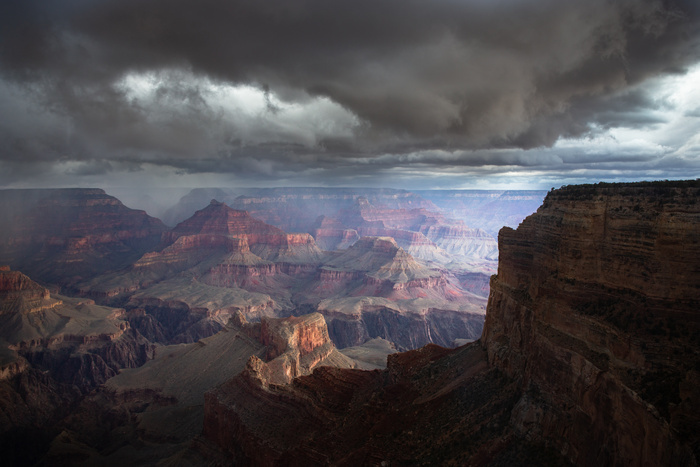 It was kinda rainy and dramatic on my trip to the grand canyon. Just wish I had brought my tripod to get a shot or two of the lightning! Very nice, lots of atmosphere. Great view and composition Dillon. Nice mood! I haven't seen GC like this. I've seen it snowy but not stormy. Almost went yesterday actually, ended up in a different spot about an hour and a half northeast of there instead though. Must be nice living nearby. I think I was maybe thinking Trevor lived near there. Yes 10 hours si a long drive. I would love to get to go there more often. I am still bummed I didn't get to go to the watch tower, and would love to have some with snow on the ground. My next trip will be to the north rim though to get the milky way over the canyon! Solid shot, I had similar ones when I was at the Grand Canyon myself, but completely flat grey skies though, I had only the bottom part of your picture, so you were lucky indeed. The post processing is very balanced, and suits the mood very well. Well done man. Thanks for commenting on the post processing that is actually the part I like the best about it!